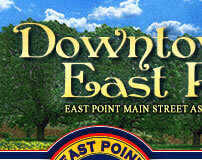 Black Tie Catering is located on East Point Street, at the in-tersection of White Way and East Point Street. 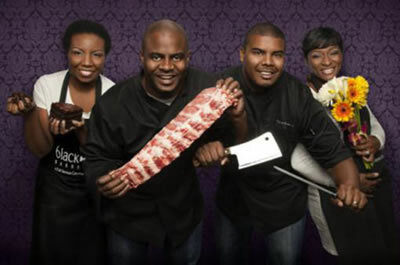 The owners, husband and wife teams Allison and Spencer Humphrey and Neil and Latoyin Rollins, started Black Tie Catering in 2009, but opened their doors in Downtown East Point in 2011. 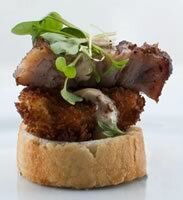 Black Tie Catering is a full service catering company. However, if you take a look at their resumes, you won't find any formal culinary training. Allison and LaToyin come from corporate law firms; both Spencer and Neil were management consultants. They learned their craft by old fashioned trial and error. Their goal is that you taste the love, care and dedication that they put into their food with every bite. Where passion for great food meets excellence in customer experience providing once in a lifetime events for every occasion, big or small. Their goal is that you taste the love, care and dedication that they put into their food with every bite! A rising star in Atlanta’s full service catering industry, Black Tie Catering focuses on provid-ing a variety of menus, from New Southern, to world cuisines near and far. Where passion for great food meets excellence in customer experience providing once in a lifetime events for every occasion, big or small. Going through the “growing pains” of a new business has meant that they haven’t been able to participate in any local events…yet. But they really look forward to participating in future events, and giving the citizens of East Point a chance to sample their passion for great food!